The third phase should take place between 500 and 5000 years. The containers and packages will degrade in turn. 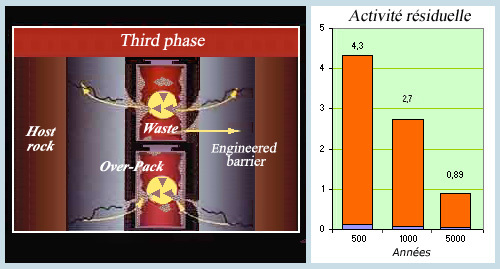 Some of the mobile radioactive elements will escape from what remains of the engineered barrier. The host rock will be left to prevent the dispersal of the radioactive material. If no water is present, the residual radioactivity (2.7 thousandths after 1000 years) will migrate through it very slowly. Some of the dispersed mobile radioelements could reach the surface.